What is SEO? Why is it important? How can title tags help? Definition: “SEO (n) - The practice of actively attempting to optimize a webpage to improve its search engine visibility”. In essence, Search Engine Optimization is about linking what people are looking for and what your page has to offer. In the ‘caveman’ days of internet SEO, certain tricks and underhanded means were available to get your page ranking higher in search engines. Nowadays the focus has moved (and continues to move) toward what the searcher wants to see and the most effective ways they can find it, which is why we need our websites to behave accordingly! Just about every bit of text throughout your site is searchable, from headings and titles to links and informative text. So if you can have the right words written in the right way placed where the user will see what they’re looking for, you’re already doing well. Websites are coded in HTML. It is a rather simple coding language at heart. If you can understand some HTML, web optimization can be a friendlier place. Essentially a tag is a command inside triangle brackets < >. If you don’t know HTML the below is still important to grasp, and can be passed onto your IT! Title tags are the title of your web page. They appear in two locations: in the tab or top of the browser (depending on the browser) and as the link in search engine results. Title tags are easy to spot in the source of the web page if you would like to go further. All browsers support a way to view the source of the webpage (If using Google Chrome it will sync bookmarks across all the devices used). Press Ctrl + U to open source in Google Chrome, or right click and select View Page Source in Firefox then press Ctrl + F to open up a find box, and then type Title and push enter. It is easy. Below is what should show up. The importance of these tags goes deeper than just the two places they are viewed. Whilst keeping in mind what people are clicking on in Google is important, there is a greater importance here. Title tags heavily influence search results and are very easy to optimize for search results. 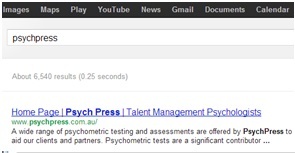 Google looks at page titles for relevance to the search term. If a title is rather generic and doesn’t contain a whole lot of keywords relevant to its business it will not rank as highly in search as it could, especially for what is presented at the front. 70 characters is currently the limit for what Google will show in its search results. Best practice would be to keep the title to 70 characters or less as beyond that Google will either truncate it or take no notice of it. Another good title for the above example is “Psych Press – Delivering Quality Tailored Psychometric Tests Online” or similar. This way when your audience is using Google they read this and think “yes, that is what I want”. Google will also read it and as it has more keywords it will match the search queries better and potentially rank higher. Changing title tags alone is not going to rank you number one on Google, especially if the title is not relevant to the content on the page. As title tags are simple to edit they are a fantastic starting point in order to improve your online performance. When thinking about the terms most relevant to your business, try to keep any technical language or jargon under control that may be casual to you and your staff but not frequent language to your target audience. If your service primarily solves issues or problems, it’s a great idea to brainstorm what people would search for at a basic level in these instances and include these terms.